The Dodgers will play host to game 1 of the NLDS at Dodger Stadium tomorrow at 6:45 p.m. against the New York Mets (RHP Jacob deGrom vs. LHP Clayton Kershaw). All auto gates will open at 3:45 p.m. and stadium gates will open at 4:15 p.m. NLDS Game 1 is sold out. The first 50,000 fans in attendance tomorrow will receive a rally towel presented by 76 and Southwest Airlines. The left-field plaza will be open to fans to enter and watch batting practice from 4:15 p.m. to 4:45 p.m.
Face painters will be on hand in the left-field plaza and DJ Adam will provide musical entertainment in the right-field plaza from 4:30 p.m. to 6:30 p.m. All-4-One, Grammy Award-winning ‘90s pop stars, will perform the national anthem. The U.S. Air Force will provide its Blue Eagles Honor Guard. Tomorrow’s military hero of the game is U.S. Marine Corps Staff Sergeant Victor Mexicano of Jalisco, Sonora, Mexico. Mexicano has been deployed to Iraq in support of three missions for Operation Iraqi Freedom. He also served a deployment to Afghanistan with the 1st Battalion in support of Operation Enduring Freedom and is currently serving at a recruiting station in Los Angeles. Ella Annear, a four-year-old cancer survivor, will throw the ceremonial first pitch. Ella’s story will be shared on Dodgervision prior to her first pitch. After a seven-month battle against stage 4 cancer, Ella “The Great” is cancer free and back in school. She will be joined by her parents, Dodger Vice President of Merchandising Allister Annear, and wife Amanda. The Los Angeles Dodgers Foundation (LADF) conducts silent auctions throughout the season featuring more than 25 signed pieces of memorabilia from Dodger players, coaches and alumni. Auctions will take place behind the Vin Scully press box on the club level. The items up for auction on Friday include a Vin Scully autographed baseball, Orel Hershiser autographed 1988 World Series baseball and Clayton Kershaw autographed Dodger jersey. The auction will end at 8:15 p.m. The Dodgers play host to game 2 of the NLDS Saturday at 6:07 p.m. against the Mets (RHP Noah Syndergaard vs. RHP Zack Greinke). All auto gates open at 3:00 p.m. and all stadium gates open at 3:30 p.m. NLDS Game 2 is sold out. The first 50,000 fans in attendance Saturday will also receive a rally towel presented by Sunrun and Stubhub. The left-field plaza will be open to fans to enter and watch batting practice from 3:30 p.m. to 4:00 p.m.
Face painters will be on hand in the left-field plaza and DJ Adam will provide musical entertainment in the right-field plaza from 4:00 p.m. to 6:00 p.m. Mariachi Sol de Mexico de Jose Hernandez will perform on the field pregame and also present the national anthem. Saturday’s military hero of the game is U.S. Air Force Major Robert Daugherty of Barstow. Daugherty enlisted in 1994 and has served as a basic Military Training Instructor and trained as a Flight Navigator and a Combat Systems Operator. He deployed to Afghanistan nine times in support of Operation Iraqi Freedom and Operation Enduring Freedom and will retire from 21 years of military service in January. Hall of Fame Manager and Special Advisor to the Chairman Tommy Lasorda will throw the ceremonial first pitch Saturday. Lasorda, who compiled a 1,599-1,439 record as Dodger manager, won two World Series titles (1981, 1988), four National League pennants (1977, 1978, 1981 and 1988) and eight division titles (1977, 1978, 1981, 1983, 1985, 1988, 1994 and 1995). Lasorda retired in 1996, was inducted into the Baseball Hall of Fame in 1997, his first year of eligibility, and his uniform number was retired at Dodger Stadium that same year. LADF conducts silent auctions throughout the season featuring more than 25 signed pieces of memorabilia from Dodger players, coaches and alumni. Auctions will take place behind the Vin Scully press box on the club level. The items up for auction on Saturday include a Clayton Kershaw autographed baseball, Kirk Gibson autographed 1988 World Series baseball and Zack Greinke autographed Dodger jersey. The auction will end at 7:45 p.m. The Dodgers’ first two Division Series and their first potential home game for the League Championship Series are sold out. A public on sale continues at www.Dodgers.com, with a limited number of tickets remaining for a potential Division Series Game 5 (Home game 3) and potential League Championship Series home games 2, 3 and 4 at Dodger Stadium. The Dodgers’ postseason schedule can be viewed online at www.Dodgers.com/postseason. Dodger fans should plan to arrive early to avoid rush hour traffic and alleviate congestion. Fans also are urged to carpool to Dodger Stadium or enjoy one of the many alternative transportation services offered. The Dodger Stadium Express, free for everyone with a game ticket, will begin service from Union Station at 4:15 p.m. Friday and 3:37 p.m. Saturday, two hours and 30 minutes before first pitch for each game. Visit www.dodgers.com/transportation for more information. The parking price for advance purchase is $15 and parking at the gate is $25 for the Division Series. The Dodgers also will offer premium parking in advance at $40 and for $60 at the gate for Division Series. Parking Lots 13 and 14 located on Stadium Way are available allowing fans easy entrance and exit and they are just a short walk to Dodger Stadium. Parking in these two lots are $10 in advance and $15 at the gate for the Division Series. Fans can purchase parking by visiting www.dodgers.com/parking. Friday and Saturday’s games will be telecast on TBS. All Dodger postseason games can be heard on iHeartMedia Los Angeles’ AM 570 LA Sports and in Spanish on Univision America 1020 KTNQ. All Dodger postseason games can also be heard in Korean on Radio Korea AM 1540. 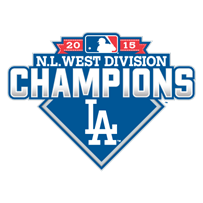 Fans can purchase official NL West championship and 2015 postseason merchandise at all team stores at Dodger Stadium Friday and Saturday. Levy Restaurants will offer an Extreme Loaded Dog, Inferno Bacon Wrapped All-Beef Dog, an all-beef hot dog topped with jalapeño relish, tomatoes, sport peppers with ghost chili aioli. It will be available at three Extreme Loaded Dog locations on the field, loge and reserve levels. Half Jidori Chicken with jalapeño cornbread, smoked baked beans, charred corn kernels served on a special pressed palm platter will be available at the Think Blue BBQ at the left-field pavilion plaza. A Steakhouse Stuffed Smoked Gouda Burger on a potato bun with dijonnaise and fries will be available at the Elysian Park Grill on the field level section 22.